How have we Christians failed to tell the world the truth about Jesus during Christmas? No, He is not a cute newborn or a religious version of Santa Claus. He is the image of the invisible God. In Him all the fullness of Deity dwells. A number of years ago during the week of Christmas there was a late-night police action in my neighborhood—an unruly party, perhaps, or some sort of illegal drug or gang activity or possibly individuals succumbing to anger and venting in a display of domestic violence. A few years later an ambulance (with accompanying EMT and fire truck) pulled up across the street in front of my neighbors’ house. We celebrate Jesus, good news to the world, because He brings peace on earth, He gives joy to all mankind. Yet so obviously, many people do not have peace or joy and do not understand the promise of Christmas. He Himself answered this form of rejection when He was talking with His disciples—first, He came to show the Father, but also by going away, He made it possible, in a manner of speaking, for the Holy Spirit to take His place. In Old Testament times Israel had God in their midst. They had prophets who told them what God said and priests who would make sacrifice on their behalf. In the New Testament the disciples had Jesus with them—talking, teaching, living, performing miracles. But now, in the “Church age” we who are part of the family of God, each one, have God in us. Consequently I enjoy the fellowship of God—His presence, His counsel, His conviction, comfort, truth, assurance. He holds my hand and to Him I cling. He is with me when I pass through the waters, when rivers overflow. He is the One in whom I will boast—not in wisdom, riches, or might. Jesus coming in the flesh made this relationship with God possible. That’s why it’s important to celebrate Christmas. It’s the single-most pivotal event in history. Some may think Easter holds that place, but Easter is actually an extension of Christmas, the culmination of it. 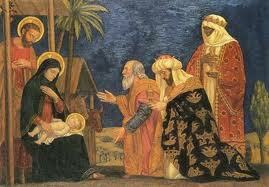 Jesus, born of Mary, was God’s first step onto earth in the skin of Man. It was the beginning, the realization of the promise, “For a child will be born to us, a son will be given to us.” Everything that night of Jesus’s birth was a shout—the great, glorious plan of redemption, worked out before the foundations of the world, was unfolding. It was being revealed to us who, through Him, would become believers in God. But so many people look past it or don’t get it. Perhaps too many have relied on slogans, as true as they may be—put Christ back in Christmas; say, Merry Christmas instead of Happy Holidays; wisemen still seek Him; Jesus is the reason for the season. Perhaps we’ve allowed the birth events to dominate the meaning of Christmas. As important as was the virgin birth, the angelic announcement to the shepherds, the coming of the magi, the real “magic” of Christmas is this “first step” in God’s plan to rescue His creation. It’s begun. And praise God that it is so! Maybe even, go tell it on a mountain. Or in a story. This article, apart from a few minor editorial changes, is a reprint of one that first posted in December 2012. I always appreciated John Eldredge and the Ransomed Heart ministry’s word picture of Christmas as part of the Epic story God is telling: this is the equivalent of D-Day in the spiritual realm. The dropping of troopers behind enemy lines to prepare for the assault on the forces of darkness holding this world and its people captive. An invasion to rescue the hearts of the beloved. How much does He love us? Enough to take that drastic of a measure to rescue us. Huzzah for our great Captain!